We all have been raising and developing our efforts for progress, one way or another. Ordinary attitudes would give up after not seeing major success. Nothing without true "sacrifice" happens overnight. Yes, we experience loss and some progress over time. That progress is training for what is to come, consequently our areas of expertise and wisdom increase and we become more valuable for advice. In this process we developed resourceful relationships within awesome tribal networks; supportive mentors, resourceful colleagues and reliable vendors around the country. For this blog-ver-sa-tion writer in the midst of the blood, sweat and tears; higher education after high school was achieved. Something that was not interesting at all, prior to becoming a socialprenuer. "Sacrifice" a word all of us know on many different levels; family, work, relationships or even for monetary savings. The work we do can be misunderstood by others. Especially when your inner circle begin to ignore and/ or exclude themselves from you during a trial of transition; subsequently wanting you to follow what they are more comfortable doing. The rewards are found within the work. If there is no effort there is no action. Motivation comes from sound sources and is a vital component, which provides comfort and support. This generates the necessary synergy to power strong strategic ideas. Success simply arrives through having a determined preparedness and imagination. The reward is through endurance of time, and only a worthy recipient will enjoy its rewards. The sacrifice could be seen and understood as pure selfishness. Then let's think about; the Wright Bros during with their consistency of attempts, Betty Shabazz during her times of having patience through hardships for righteousness or the single mom consistently taking care of the family unselfishly; are they even comparable? Whatever level of life you are enduring a trial for personal development just remember, "After difficulty comes ease, after difficulty comes ease, Verily after difficulty comes ease...". 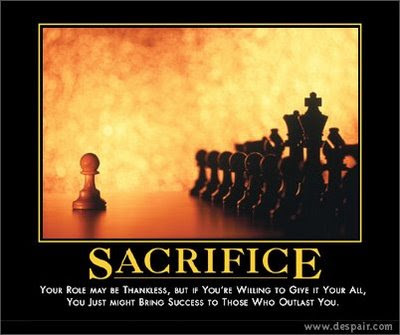 Sacrifice: In the game of chess, a sacrifice is a move giving up a piece or pawn in the hopes of gaining tactical or positional compensation in other forms...."Google define:sacrifice"